This lovely 2005 Model Mercedes Sprinter has everything you need to cruise around the Coast near Byron. Extremely comfortable queen sized bed for camping in Byron Style. Perfect for festivals, surf trips, camping trips and outdoor adventures. Accommodates three (the driver and two passengers). Immaculately clean and equipped with everything you need, ready for adventure. Gas cookers, table and chairs, camping and picnic equipment and fridge. 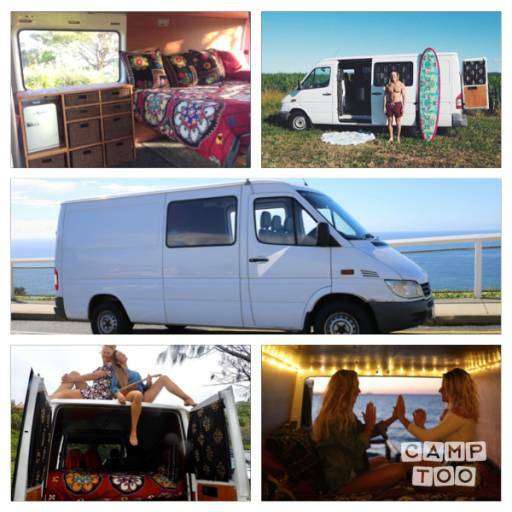 Inside the van is a queen bed with a real innerspring mattress, quality linen, goose down doona (duvet) and beach and bath towels are provided. There is room under the bed for surfboards, and travel bags. Find one of the many great places to stay in the van around byron, from beach front camping grounds, riverfront serenity to freedom camping in the wilds. There are also great camping spots in the areas surrounding Byron. Roadside assistance included with NRMA.